I am less myself from December through October, and I have not yet figured out how to change that. In November, I am frazzled, distracted, overwhelmed. I make mistakes and don’t bother to correct them. I let stories become more important than anything else, waking early and going to bed late just so that I can have a few extra hours in this filled-with-holes world I have created. I feel intensely alive the entire month. It is glorious. And this journey I undertake for thirty days once a year necessitates that I reread this book. It reminds me to approach the words with a sense of wonder, to allow for adventure, to have stupid amounts of fun. Come the first of December, I will have to accept the flaws, the editing, the ridiculous plot – but for now, I am allowed to write with all the abandon of a child. It is a worthwhile thing. 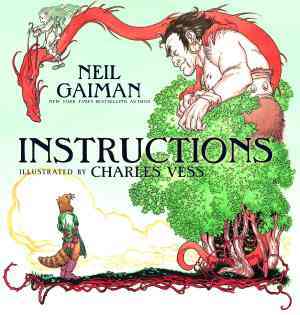 You should find this book and spent time looking at the pictures, because they are wonderful, but until then, here is Gaiman reading the whole thing to you, because the internet is excellent that way. For more about Gaiman, head over here. It’s important to allow yourself to abandon all reason and dream big once in a while. Beautifully written post. Good luck with the novel writing! Thanks! I agree – it definitely feels good to let loose on fiction every once in a while! Best wishes on your writing endeavor! I love this book you had posted. Thank you for sharing:D I will be sure to get a physical copy… Namaste! Thank you very much! It is such a wonderful book. I hope you enjoy your copy as much as I have mine. Isn’t it beautiful? I’m so glad someone took the time to record and post the images; they’re even more beautiful on the page, but I love getting to listen to them while one of my favorite authors reads the story!